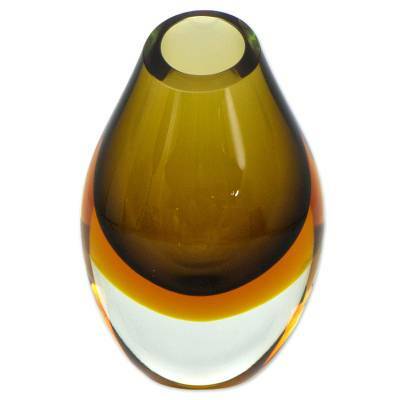 Murano Inspired Earthtone Brazilian Blown Art Glass Vase, "Olive"
Exuding an earthy glow, this simple, yet stunning vase is sure to add an eye-catching element to your home decor. The Seguso family of Brazil brings this elegant hand-blown vase to life using traditional techniques from Murano Island in Italy. The presence of air bubbles accentuates the nature of the traditional hand blown crafting process, making each piece unique. You can find art glass vase 'Olive' by Seguso Family in vases categories such as Art Glass Vases, Modern Vases, Handblown Vases, Murano Vases and Glass Vases. Enjoy exploring these sections for other Novica treasures. Mario Seguso, the patriarch of the Seguso Family, was born in 1929 in Venice, Italy to one of the oldest and most famous blown glass artisan families on the island of Murano. His ancestors have crafted art glass since 1300. In 1956, Mario created his own workshop in Brazil. He has passed on his knowledge to his sons, grandsons and the artisans working with him. He is proud to have many assistants and to have trained eight glass masters in his workshop. The Seguso Family provides work for a number of full-time blown glass artisans. The Seguso Family has been recognized for the creativity and originality of their work and always are cited in news articles, award ceremonies and retrospective exhibits. The artistry of the Seguso Family has been featured in Depth magazine. Present since 1300 in the census books of Murano, Italy, today the prestigious Seguso glass-crafting family has a Brazilian branch. In 1954, Mario Seguso was invited to execute special commemorative pieces for the 400th anniversary of the city of São Paulo. Enchanted by Brazil, he decided to settle there and, in this way, to continue the family line in this country. His intention was to produce serious, artistic work of the highest level, and become known throughout Brazil and in other countries. After years of supervising the production of artisan crystal, he assured its continuity through his sons Michel and Adriano, who carry on the Seguso Family tradition. Since then, the Seguso Family has been recognized for the creativity and originality of their work and always are cited in news articles, award ceremonies and retrospective exhibits, with an increasing number of admirers and collectors interested in the passionate art of glass. I purchased ""1000 Red Flowers"" and ""Spherical Phoenicia"". I was amazed at the perfection and beauty of these paperweights. They bring a sense of ""joy energy"". I love them! Thank you. The ""1000 Black Flowers"" paperweight is lovely and wonderfully made.